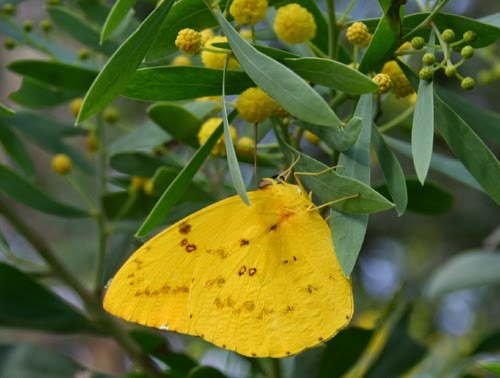 If you grow native cassias, you will always have yellow butterflies in your garden. 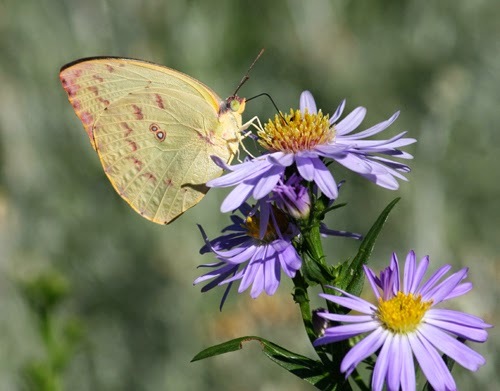 Butterflies like to hang around their host plants - the plants which have the right kind of leaves to feed the babies of their particular species - and cassias are hosts to a number of butterfly species. 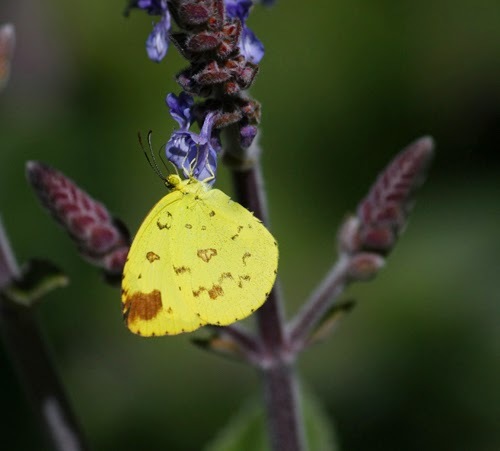 It is a great idea to put in a group of these pretty, sun-loving plants, making it easy for butterflies to notice your garden and move in. Cassias have been subject to one of those name changes that botanists inflict on us, periodically. They are officially Senna species these days, though most people still call them cassias. 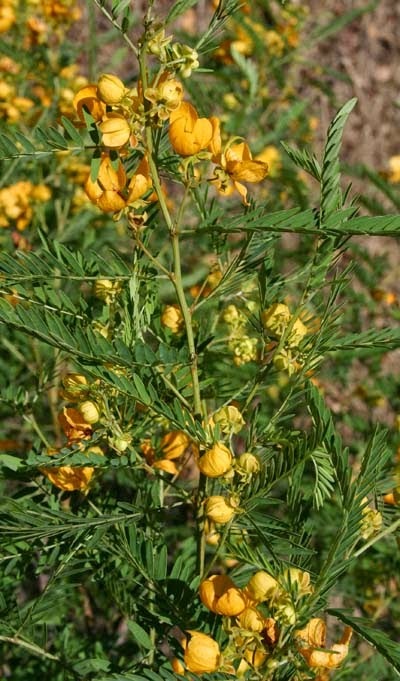 Three local species, Brush Senna Senna acclinis, and Brigalow Senna Senna coronilloides, and Desert Senna, Senna artemisioides subsp. zygophylla, are all excellent choices for even the smallest garden, as they are easy to keep to waist height by pruning once each year after flowering has finished. Native cassias also seem to bring sunshine into the garden, with their summer-long display of bright yellow flowers. They are always aware of the sun, these plants, closing their leaves at dusk, and opening them again in the morning. Sennas are tough, drought hardy plants. Our local species also tolerate all but the hardest of our local frosts. Their lifespan is somewhere between four and ten years. Plants that are pruned, fertilised and watered once a year after flowering (in autumn) live the longest. They will grow in full sun, where they make dense screening foliage. They are also happy to fit in politely between other shrubs, never overwhelming them, but fitting their flowering branches into the gaps. These Senna coronnilloides are sharing the dappled sunlight under some trees with some wilgas. New plants are easy to grow at home from seed. Put them into a coffee cup, cover with boiling water and leave to soak overnight, before planting those which have swelled. You get double environmental points for growing this local plant. Not only is it a butterfly host. It is also a threatened plant, having lost most of its rainforest edge habitat through clearing. 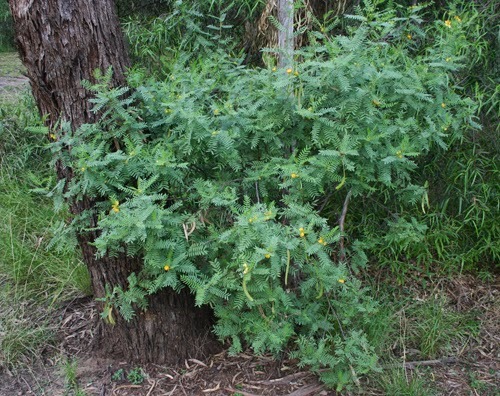 A few plants can still be found growing wild on the western edges of Toowoomba, at sites such as Kingsthorpe Hill and Birdwood Sanctuary, but it is rare to find them in the district nowadays. 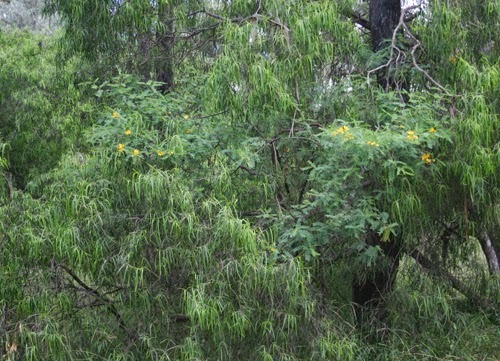 It is occasionally mistaken for the Easter Cassia (Senna pendula var. glabrata), a South American plant which fell out of popularity in gardens because of its tendency to grow to large, too fast, too leggy and too weedy-looking. It has never disappeared from the district, though, as it has jumped the fence to become an environmental weed. It may come up in your garden whether you want it or not. 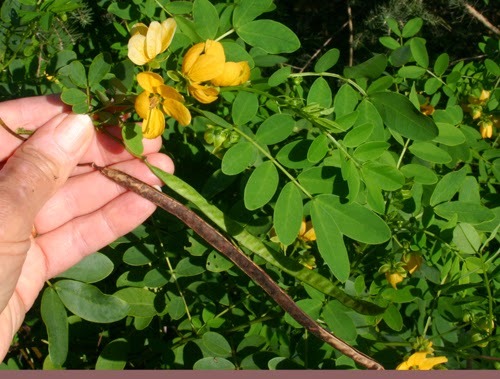 The brush senna is a more civilised plant, with a longer flowering period. It grows to between waist and shoulder height (depending on whether or not you have pruned it), and makes a dense screen. It may self-seed to some extent, if you are lucky, but a more reliable way of making more plants is to grow them from seed. This equally desirable plant loves the heavy black soil to the west of the Range, but is happy on all soils. Its fine leaflets are blue-green. Great post ... thank you Patricia. I have linked to your post as a useful reference about Easter Cassia alternatives. Thanks. 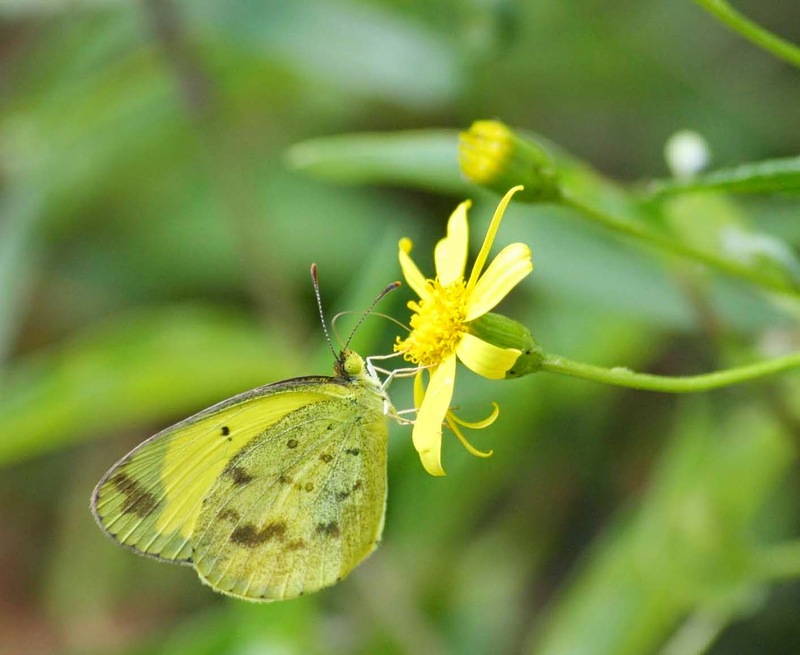 It would be great to see more Australians growing our own native cassias, especially (in the Brisbane area)Senna acclinis. Unfortunately, this rare native is often weeded out by people who think it is Easter Cassia, and want to get rid of it urgently in the belief that it will become weedy. 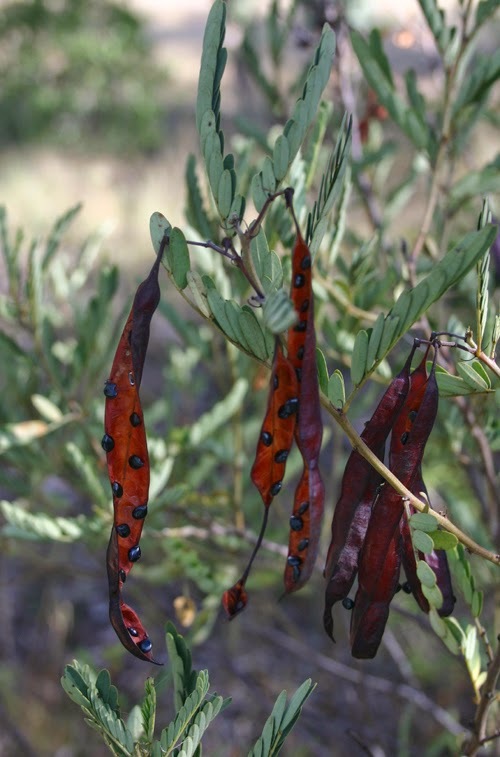 A site about plants indigenous to the basalt soils of inland south-east Queensland, and suitable for use in gardens. The area it covers is roughly bounded by the Great Dividing Range, the Condamine River, the New South Wales border and the Bunya Mountains. If you've found an article interesting, please do comment. I will value your feedback, questions, corrections and further information - and I'm sure that other readers would appreciate hearing more points of view than those which come from me. NOTE: Your comments do not appear on the site until I've had time to approve them for publication, so don't worry if what you wrote seems to have disappeared into limbo. It will get there. I try to respond wherever a response is called for, so do check back later.